Visited the Southport Flower Show today, Thursday, only 16 miles from Preston along the A59. Enroute was impressed by the large flat fields that are now on the Ribble Estuary. Don’t recall fields being that far out before. Would it be worth laying a road towards Lytham that could be used at low tide. Around half a million people live on the Fylde and millions travel to Blackpool, such a link might benefit the regions on both sides of the river and be an interesting novelty crossing. The flower show was a lot better than expected. Spread over Victoria Park fairly close to the centre of Southport. Lots to see including; mmmm …..flowers, stalls selling mainly garden stuff but quite a lot of fashion and food producers; had an excellent steak pie in great pastry from the food tent. There is an arena and a bird handler had a very large eagle and vulture which were one of the high spots, incredible, as well as dog handlers and some stunt men. The Amateur Gardening Tent was good with some excellent veg; leeks bigger than your arm. Very tasty looking fruit presentations and flowers. All kind of horticultural displays including Robinsons Mammoth Onion, interesting modern floral displays, show gardens with an impressive winner. 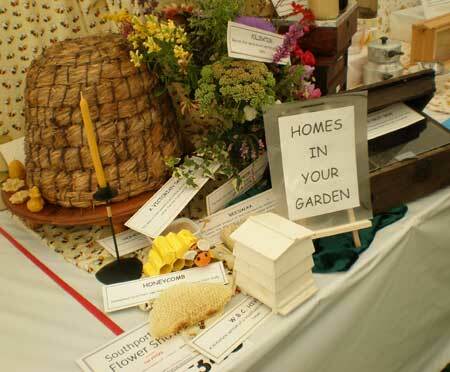 Enjoyed the Bee and honey tent, photo below of the display winner in one category. That’s a lovely old hive and the display had 4 types of hive. A long day arriving at 10 and leaving at 4 which is unusual for us and it seemed there was more catering at Southport than at Tatton so the queues were shorter. Good day out, on until Sunday, not cheap, save money by booking tickets in advance. Maybe you book ahead and pick them up at the show, check.